Jill Dupleix is a celebrated Australian food writer, restaurant critic and cookbook author. She was also food editor for The Times in London for six years. 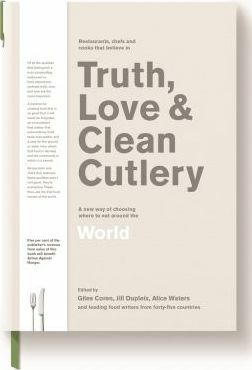 She is the founding editor of Truth, Love & Clean Cutlery.Giles Coren is a London-based columnist and award-winning restaurant critic for The Times newspaper. He is author of the best-selling How To Eat Out, presenter of two current hit BBC TV series', Back In Time For Dinner and Amazing Hotels, and is Editor-at-Large of Esquire UK.Alice Waters is a chef, author, food activist, and the founder and owner of Chez Panisse restaurant in Berkeley, California. She has been a champion of local, sustainable agriculture for over four decades. In 2015 she was awarded the National Humanities Medal by President Obama, proving that eating is a political act, and that the table is a powerful means for social justice and positive change.